Abstract: When VIA released the KT133 chipset last year, only a few motherboards had multiplier adjustments. When VIA released the KT133 chipset last year, only a few motherboards had multiplier adjustments. The most popular motherboards in this arena were basically Asus's A7V or Abit's KT7 series (KT7 and KT7-Raid). With the release of the VIA Apollo KT133A chipset things are now quite different, and dramatically improved if I do say so myself. 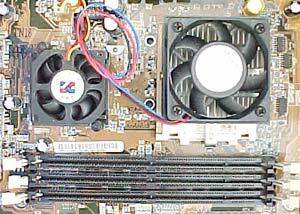 Most of the large motherboard manufacturers now allow multiplier manipulation in either the BIOS or by the use of jumpers. First though, what is the difference between the KT133 and KT133A chisets? The answer is a simple one, the KT133A is basically the same chip as the KT133 except for the fact that it has been tweaked to allow Athlon processors to run at a 133MHz/266MHz bus. Before the KT133A chipset arrived, Athlon overclockers had a ceiling of around a 115MHz system bus. That wasn't very high, and in fact, that was really unimpressive. Thankfully the KT133A chipset arrived so it is now possible to reach 150MHz or higher bus speeds! Based on the KT133A chipset, the Asus A7V133 allows us to make use of the 133MHz/266MHz based Athlon processors, as well as the "normal" AMD 100MHz/200MHz processors. The A7V133 also features VIA's 686B south bridge, enabling the use of Ultra 100ATA data transfers. A Promise IDE RAID controller can be used for secondary Ultra100 function as a Raid controller (only Raid-0 configurations) aswell. Rounding out features, the A7V133 comes equipped with 4 USB ports, no less than 4 fan headers, and optional onboard audio compliments of VIA's AC'97 codec. I was disappointed that Asus decided to skimp on thermal material between the KT133A chipset and the green BGA chipset however. Other then that, I don't think I can complain about the board at all! It's pretty well laid out, with lots of space around the CPU socket (enough for the my Alpha PEP66T0 for instance. It's nice to know that larger heatsinks like the GlobalWin WBK-38 and ThermalTake's SuperOrb will fit on the board with out incident. Also, since the PCB has the four mounting holes surrounding the socket, heatsinks like the Zalman CNPS5000 that bolt on to the PCB could be used if desired. Something that I found quite useful while installing the system was the fact that I didn't have to remove my AGP video card to install the sticks of memory. You've probably noticed that the A7V133 only has 5 PCI slots, the reason behind this is because the onboard Promise IDE controller is basically taking up the resources of 1 PCI slot. To make sure there aren't any hardware conflicts Asus decided to only include 5 slots. I know motherboards like the Abit KT7/KT7A series have 6 PCI slots, but if you read their specifications carefully, you can only plug a maximum of 5 PCI bus mastering devices into it at any one time. One thing that I believe is a waste of time (and money) is the AMR slot; the board in front of me has one, and I have absolutely no intention of ever using it. A feature that I do like is the AGP Pro slot. Yes I know that there aren't any consumer based AGP Pro cards, but I like to have the option regardless. Pg 2. What are the full specs on this motherboard? Pg 3. The Asus BIOS - Revolutionary?